Hardy or perennial geraniums also have the common name of “cranesbill” because their seedpods resemble crane’s bills or beaks. The plants most commonly called geraniums – tender annuals with the brilliant red and pink lollypop flowers – were moved to the genus Pelargonium in 1789. The wrong common name has persisted all these years, surely the earliest case of identity theft. 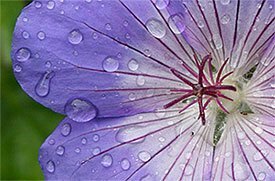 Regardless of what you call them, the hardy geranium species include some of the most charming and indispensable perennials for different garden purposes. Hardy geraniums aren’t garden stars, but they are work horses that can softly fill space between taller perennials with grace and versatility, providing added value by smothering weeds. In addition to perennial borders, these reliable plants are equally good at knitting together shrub borders, rock gardens, and woodland beds. They can even hide the knobby knees of shrub and tea rose plantings. Some geranium species make fine ground covers in dry shade under trees. Hardy geraniums flower in late spring with shades of white, pink, lavender, blue and magenta. Their charming flowers are usually single, less than 2 inches across and held above the foliage. The leaves are usually round and attractively lobed and/or incised. Some types provide a second flowering if you cut them back after the first flush. Still others, like G. ‘Rozanne’, 2008 Perennial Plant of the Year, can flower all summer. Many perennial geraniums will grow in zones 4 to 8, and do well in full sun to part shade. When planting, give them enough room for the foliage to spread a distance at least equal to the mature height. There are no special soil requirements, but drainage must be good. Moist, well-drained soil is ideal, but they will tolerate some drought. 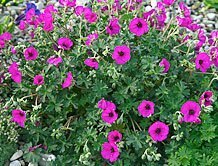 Easy to maintain, geraniums are rarely bothered by pest or diseases. Depending on species and cultivar, plant sizes vary from a few inches to 3 feet tall and come in all shapes – mounds, mats, spreading masses and bushy clumps. Some, like ‘Ann Folkard’ will even climb and scramble within shrubs or large perennials.